The third-seeded Indian started the match in a convincing manner as he stretched his opponent in the very first game enormously. Serving first, the Czech international looked nervy to Myneni’s imposing play and had to save as many as two break points to keep the lead. However, the same didn’t happen in the third and the fifth game where Myneni broke the Czech to win the first set 6-2. Myneni was easier to read for the Czech in the second game and he hardly struggled to win from his serves, barring the third game when Myneni managed to break him for once. The Indian won the second game 6-4 to set up a clash with the defending champion Gunneswaran. Mukund, however, was nowhere close to such dominance like his teammate as was evident in his clash with Ban Yai. 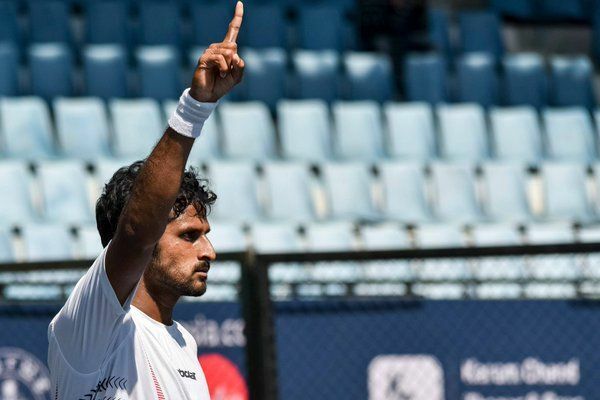 Yai got chance to break Myneni four times in the very first game before the Chinese eventually succeeded and although Mukund looked to regain control in the third game, Yai won the fourth and sixth game to win the first set 6-1. Mukund was expected to come back stronger in the second game but he only got lucky this time. He won his first serve by saving three break points and one in the third and fifth game each to drag it to the final game. In the final, he saved two break points and one match point eventually succumbing to a 6-4 defeat. Bai would face Ramanathan next.